Kurt Bikkembergs, Erica Budai, Ludo Claesen, Roland Coryn, Johan Duijck, Jacqueline Fontyn, Wim Hendrickx, Vic Nees, Lucien Posman, Raymond Schroyens, Gwendolyn Sommereyns, Rudi Tas, Wim Hendrickx, Luc Van Hove, Kristiaan Van Ingelgem, Maarten Van Ingelgem, Sebastiaan Van Steenberge. 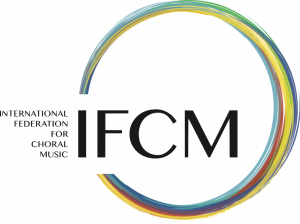 The purpose of this article is to provide a brief introduction to a few representative composers and some of their works. Regrettably, it is not possible in this short column to give detailed presentations of each. Information is provided, however, so that the interested individual may do additional study. Roland Coryn (b. 1938, Kortrijk) undertook musical studies at the Stedelijke Academie voor Muziek en Woord in Harelbeke (City Academy for Music and Word), and the Koninklijk Muziekconservatorium Gent (Royal Conservatory of Ghent), studying viola, chamber music, and receiving First Prize in composition. He performed for many years, taught composition at his alma mater in Ghent, and has been a full-time composer since 1997. 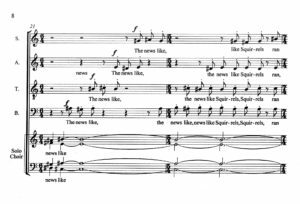 Many Flemish composers set texts in English, and Coryn is no exception. He has been a devotee of the language, setting such writers as Emily Dickinson, Edgar Allen Poe and William Blake in their original English, as well as Li Po in English translation. 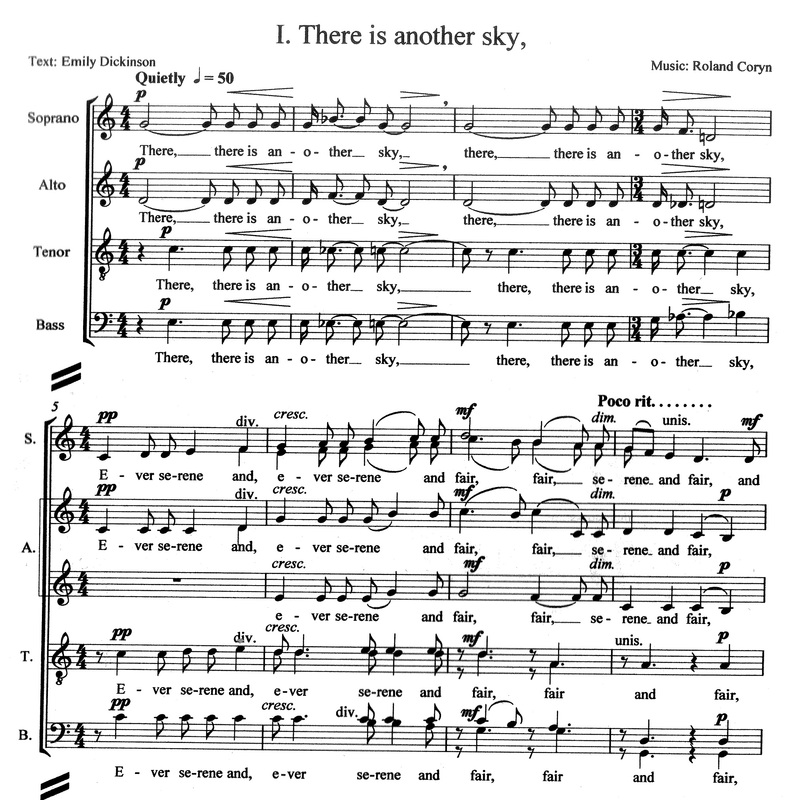 A 2005 composition, Coryn’s There is Another Sky is a choral song cycle of five unaccompanied works using poems by Emily Dickinson. The composer has used lush harmonies, pandiatonicism and pantriadicism. Coryn, Roland. There is Another Sky, ©2005. Used by permission. His work, Death Be Not Proud, using a text by John Donne, makes use of mixed and changing meters. Coryn, Roland. Death Be Not Proud, ©2006. Used by permission. Coryn’s 2008 work, Canticum Canticorum Salomonis, is scored for violin solo and chorus. 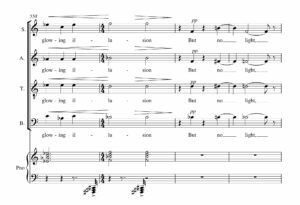 Coryn scores separate sections for the treble and male voices to correspond to the bride and bridegroom speakers in the text. Substantial divisi occur. The text is scored in Latin. The violin is used to open the work dramatically, introducing rhythmic and pitch patterns which are incorporated in the piece. 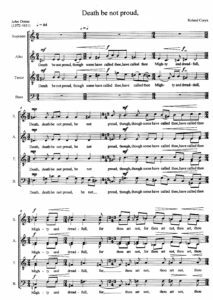 It is later given overtones in several sections. Coryn, Roland. Canticum Canticorum Salomonis © 2008. Used by permission. Vic Nees (b. 1936, Mechelen) studied composition with Flor Peeters at the Conservatory of Antwerp. 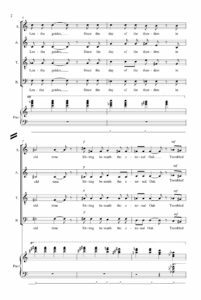 He also studied composition and choral conducting with Kurt Thomas in Hamburg. He began as a producer of choral music in 1961 at the Flemish Radio in Brussels, serving as the conductor of the Radio Chorus from 1970 to 1996. He has played a significant role in the choral movement, and adjudicated in many international competitions. He is now a member of the Belgian Royal Academy. Nees’ many years as conductor of the Flemish Radio Choir brought him in contact with a variety of music, and are in part responsible for his self-designation as an “eclectic composer.” He also has been influenced by Les six, Messiaen’s harmonies, Britten and Tippett’s choral traditions, the Polish composers of Penderecki’s generation and American minimalists. 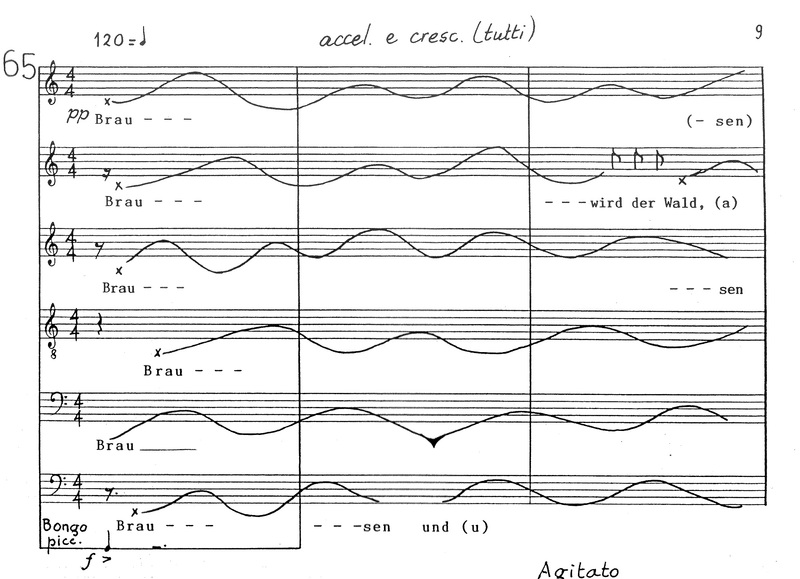 He also cites Hugo Distler as an influence for learning how to set text, having studied the opposition between text prosody and musical rhythm in his Mörike Chorliederbuch. 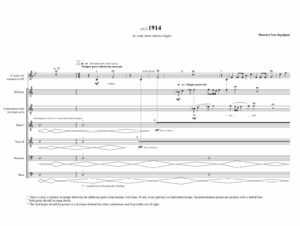 Nee’s 2005 work, Trumpet Te Deum, is scored for two trumpets, soprano soloist, and mixed choir (with divisi), written for conductor Peter Dejans for the 15th anniversary of his ensemble, Musa Horti. Nees makes use of a variety of compositional techniques in the work, and it is an example of his eclecticism. 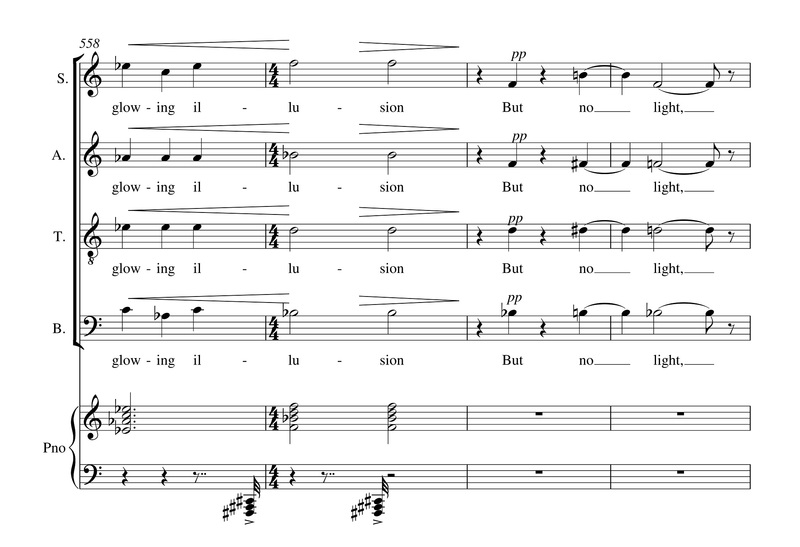 The Te Deum is opened with the two solo trumpets with homophonic choral singing. 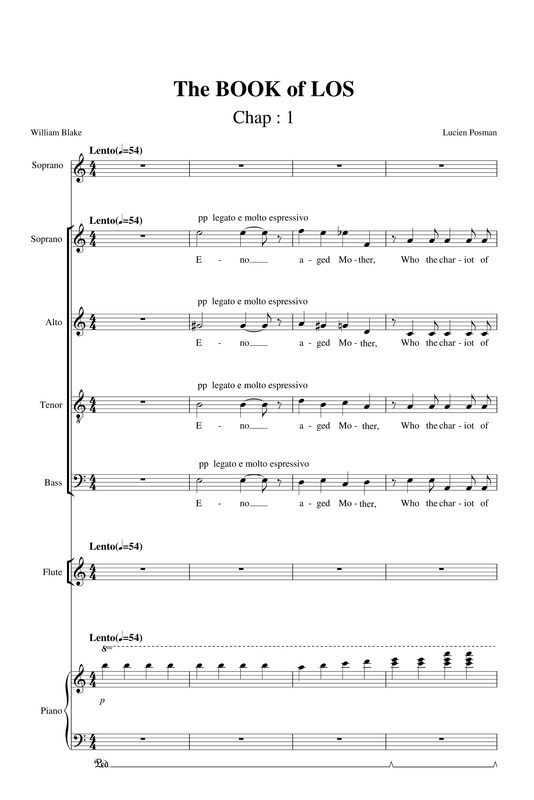 The second movement, Te gloriosus, makes use of four-part men’s voices and four-part treble voices. Nees uses a technique of placing rests mid-syllable and mid-word. This first occurs simply as interrupted text. 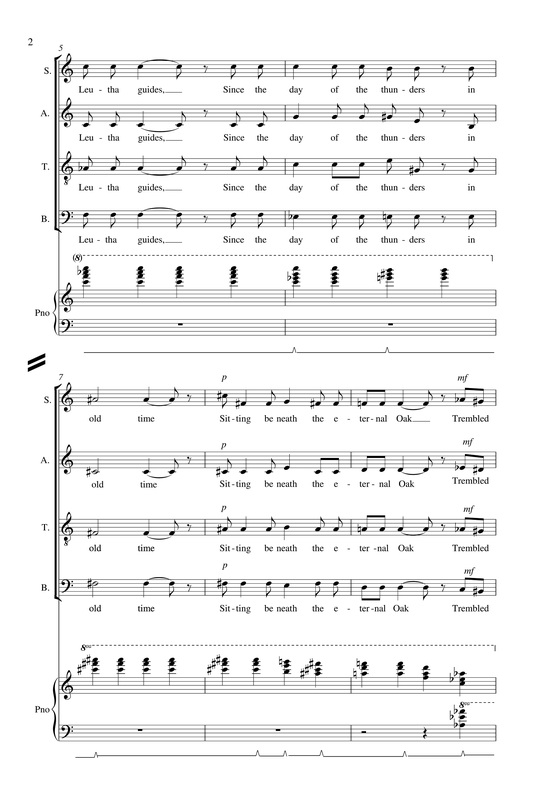 However, when the male and treble voices are juxtaposed, it resembles medieval hocketing. 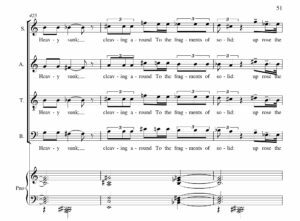 The Tu Rex gloriae movement is opened with four part male voices in a repeated C major chord (with occasional Bb major) forming a layer over which the treble voices are scored in seconds. 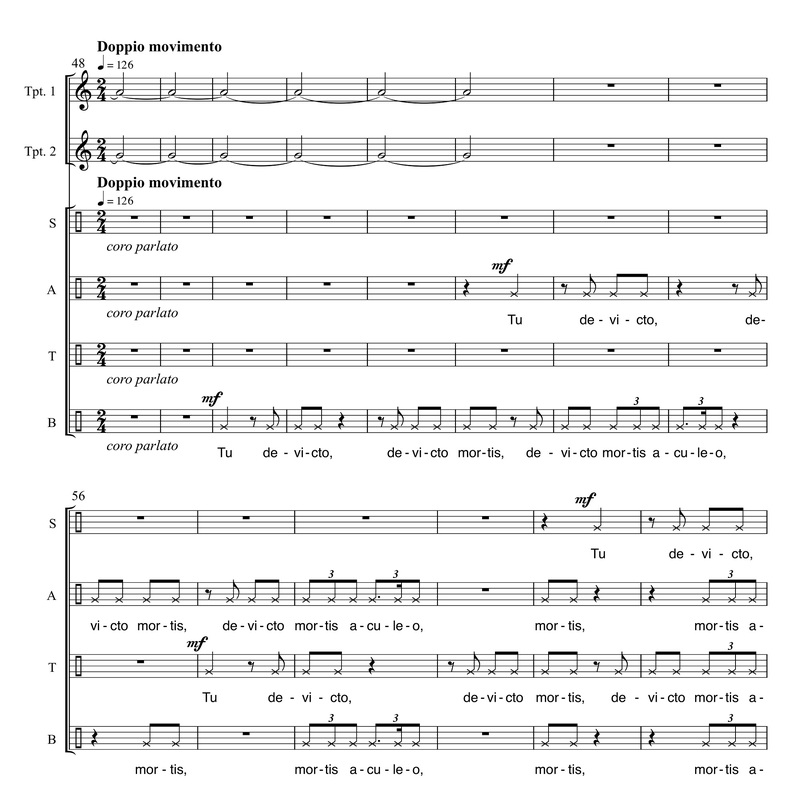 A coro parlato technique is used effectively in the Tu devicto section. Nees here uses an additive technique with the text, in which a portion of a phrase is introduced, and repeated with additional text, and so on. 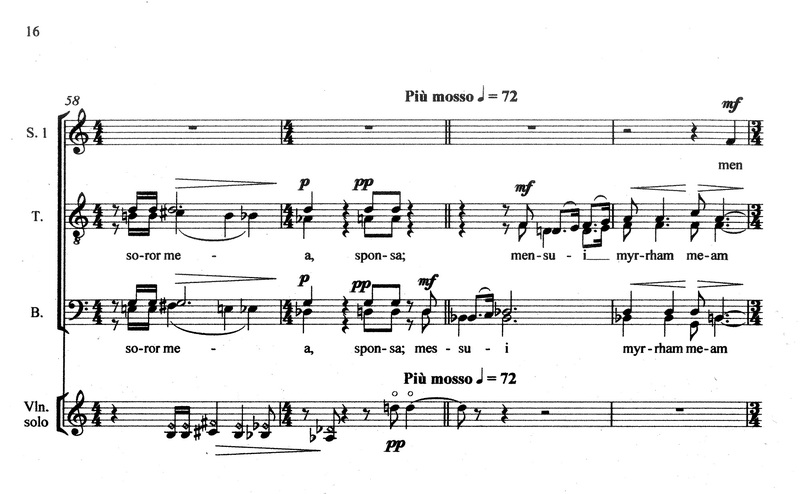 This section has contrapuntal and homophonic portions. 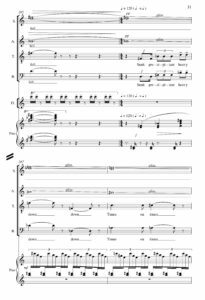 The score is published by Annie Bank (www.anniebank.nl), and a recording of the dedicatee ensemble is available through Phaedra. 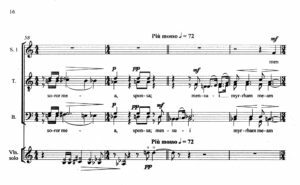 Other notable compositions by Vic Nees include Vigilia de la Pentecosta; Magnificat; Veni Sancte Spiritus; Concerto per la beata Vergine; and Requiem. Nees, Vic. 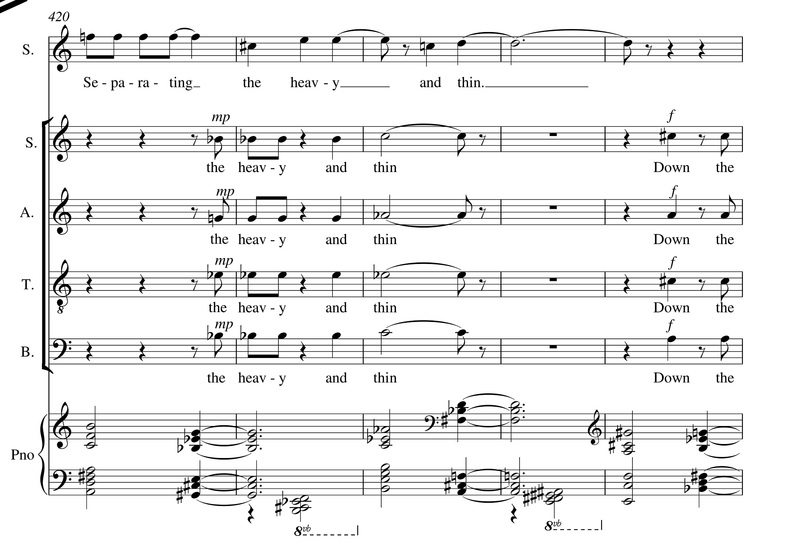 Trumpet Te Deum, p. 32. © Copyright by Annie Bank Edition, the Netherlands. Used by permission. Lucien Posman (b. 1952, Maldegem) pursued musical studies at the Ghent Royal Conservatory (with Roland Coryn) and at the Royal Flemish Conservatory of Antwerp, where he earned first prize certificates in music theory, music history, harmony, counterpoint, fugue and composition. 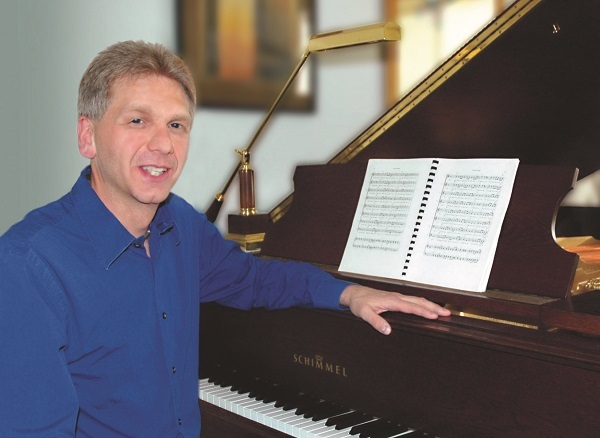 He presently teaches music theory, composition and pedagogy at Hogeschool Gent. Posman was the Artistic Director of De Rode Pomp, a concert hall for chamber music. He is the co-founder of the European Composers Collective (ECCG), and a member of the editorial staff of the ‘Nieuwe Vlaamse Muziekrevue’. The Book of Los, using texts in English by William Blake, was written in 2000. 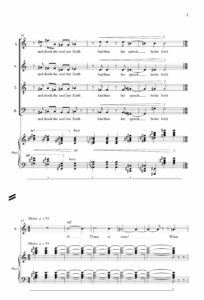 It is scored for soprano soloist, flute, piano, and mixed choir. This monumental work is approximately 25 minutes in duration, and recorded on Cyprès (CYP 4616) by the Goeyvaerts Consort (now known as the Aquarius Kamerkoor). Its four attached movements parallel the four chapters in Blake’s book. The pianistic writing is for that of a partner instrument, not simply an accompaniment, and the same can be said of the flute (which is notated for flute, alto flute, and piccolo). 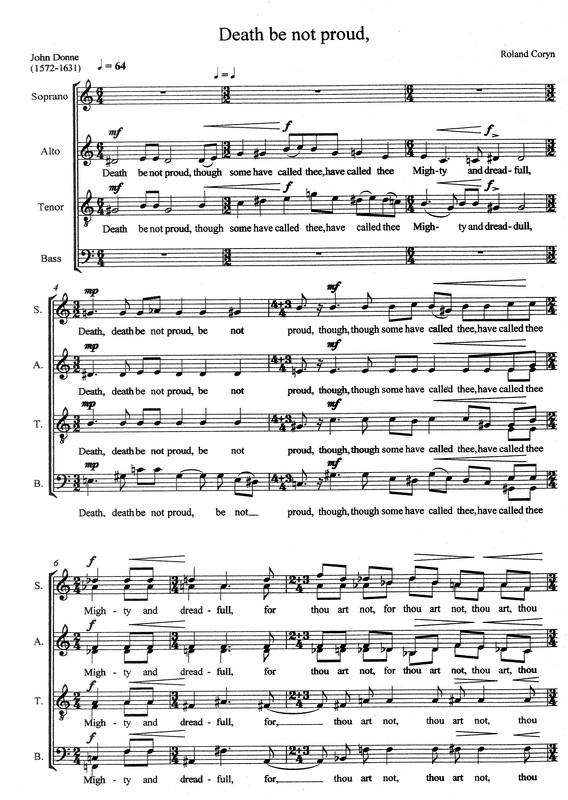 The work has proper scansion for the singers throughout. 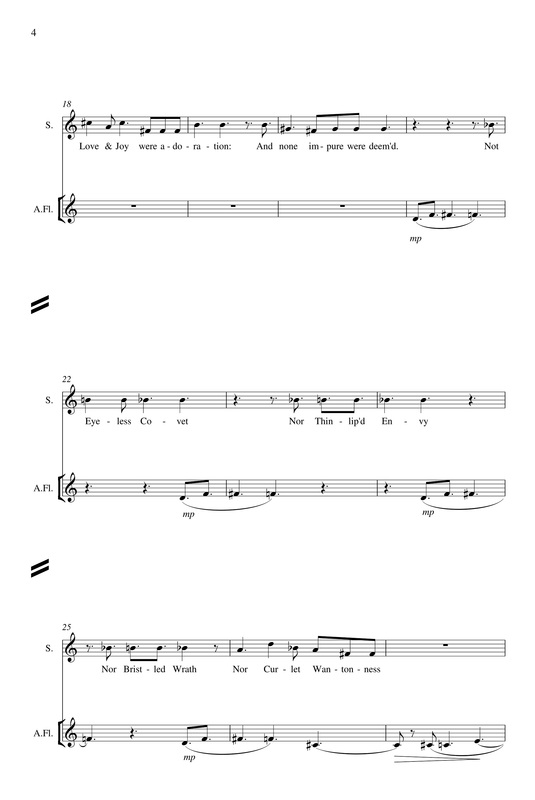 The first movement, “Chapter 1,” is opened with a single repeated b in the piano, followed by the chorus, while steady chords continue in the piano. Posman makes use of planing and pantriadicism. 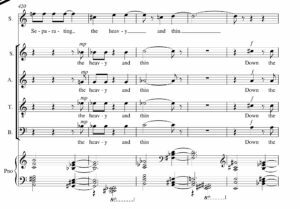 The opening harmonies progress: [b, E, d, E, c, d, a, f, c, E, F#, e, F#, d, Ab (enharmonic G#), F#, G# (enharmonic Ab), Bb, g#]. 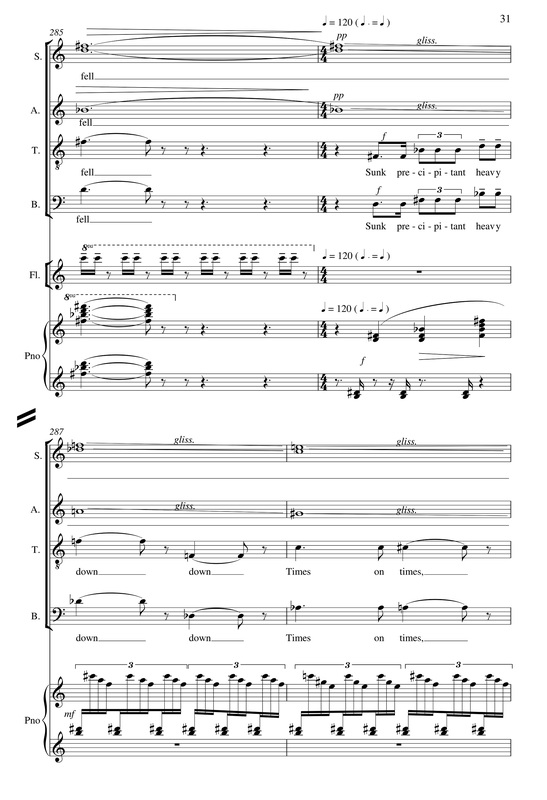 A clever use of enharmonics is given to the choir in measures 9-10. 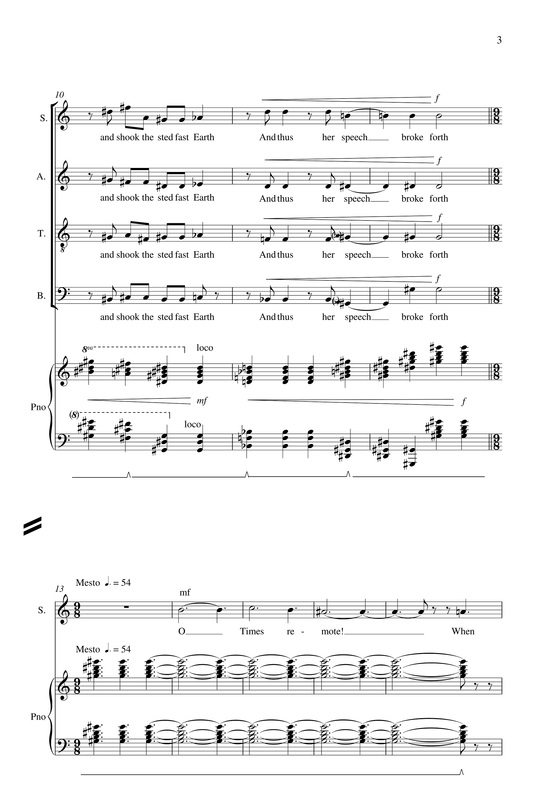 Here, the soprano is introduced using the words of the character Eno, and in measure 13 the meter shifts from 4/4 to 9/8. 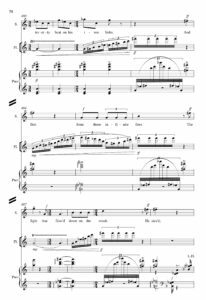 The soprano soloist is given rhythms that correspond to the triple feel, however, the alto flute is given a duple rhythm at each entrance in a duet section. 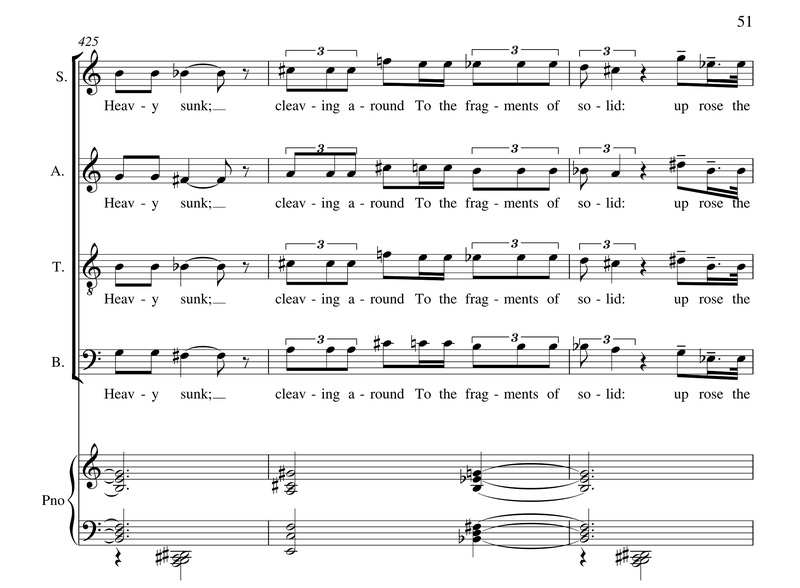 In measure 28, a repeated chord is introduced in the choral parts, and is somewhat reminiscent of the opening piano chords. Posman, Lucien. The Book of Los. (2000) pp. 1. Unpublished manuscript. Used by permission. Posman, Lucien. The Book of Los. (2000) pp. 2. Unpublished manuscript. Used by permission. Posman, Lucien. The Book of Los. (2000) pp. 3. Unpublished manuscript. Used by permission. Posman, Lucien. The Book of Los. (2000) pp. 4. Unpublished manuscript. Used by permission. 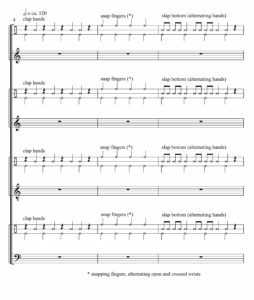 The second movement, “Chapter 2,” is harmonically rich and adventurous. 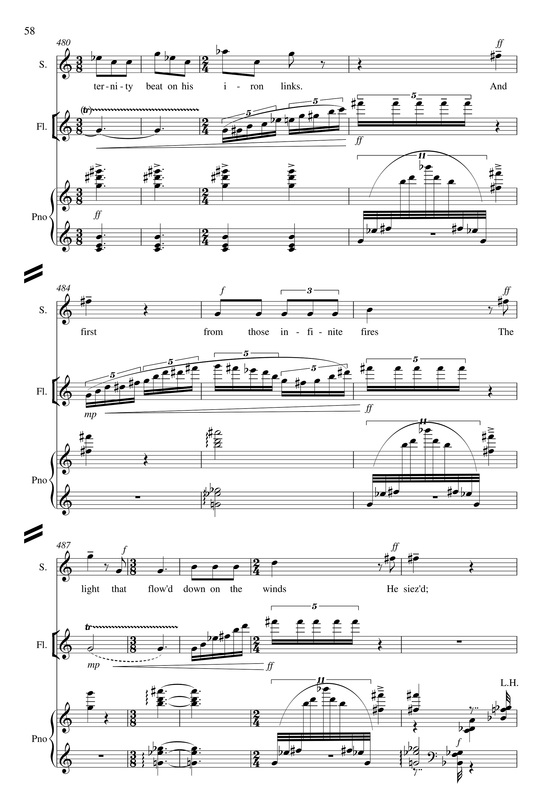 The shimmering effect in the piano beginning in measure 287 requires an adept player. Glissandi over small intervals are given to the singers in long note values. Posman, Lucien. The Book of Los, p. 31. Unpublished manuscript. Used by permission. Posman, Lucien. The Book of Los. (2000, measures 420-427). Unpublished manuscript. Used by permission. The fourth movement is opened by the soprano soloist. 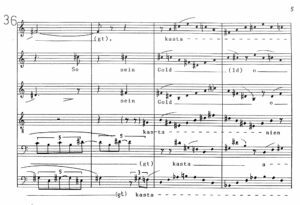 In this movement, Posman makes use of polyrhythms, juxtaposing quintuplets in the flute against undecaplets in the piano. 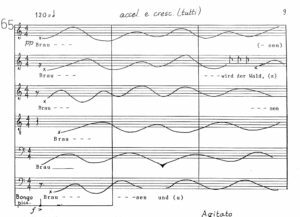 A brisk tempo and the indication molto nervoso introduce a section of rhythmic complexity and interest by the listener in the soprano, flute, and piano parts. The closing of the work includes repeated pitches in the upper register of the piano, paralleling its opening. Posman, Lucien. The Book of Los. (2000) p. 58. Unpublished manuscript. Used by permission. Posman, Lucien. The Book of Los. (2000) measures 558-561. Unpublished manuscript. Used by permission. Kurt Bikkembergs (b. 1963, Hasselt) studied music education, composition, and conducting at the Lemmens Institute in Louvain, and served as choirmaster for the Flemish Opera 2002-2008. 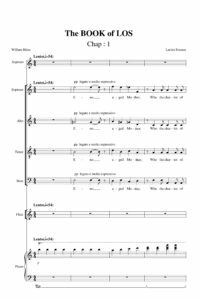 Bikkembergs is currently Kapellmeister of the Cathedral of Saints Michael and Gudule in Brussels, and directs the Capella di Voce in Louvain. His extensive compositional output includes many sacred works, as well as pieces for children and youth. 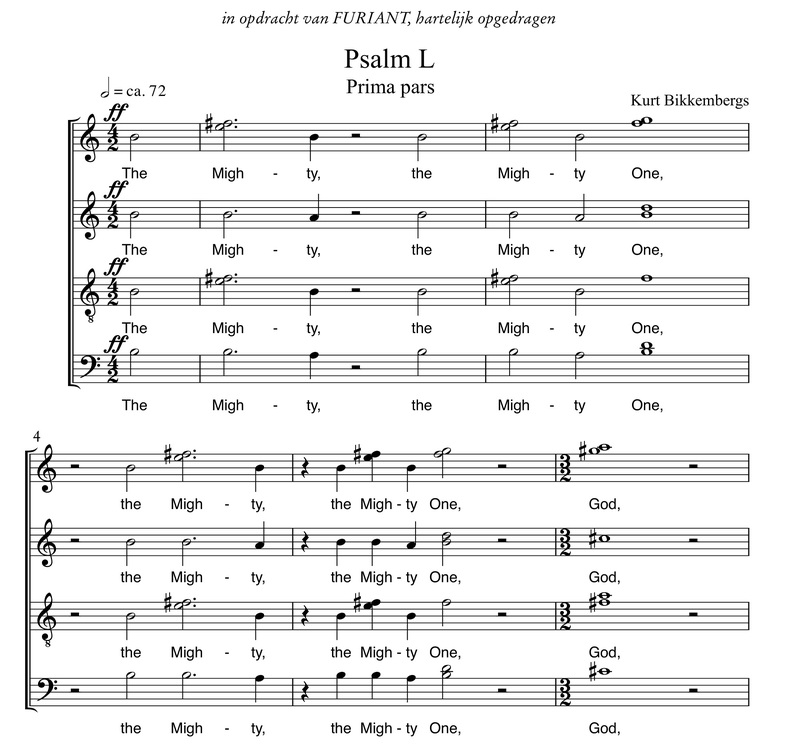 A 2007 work, Psalm L, is scored in English. 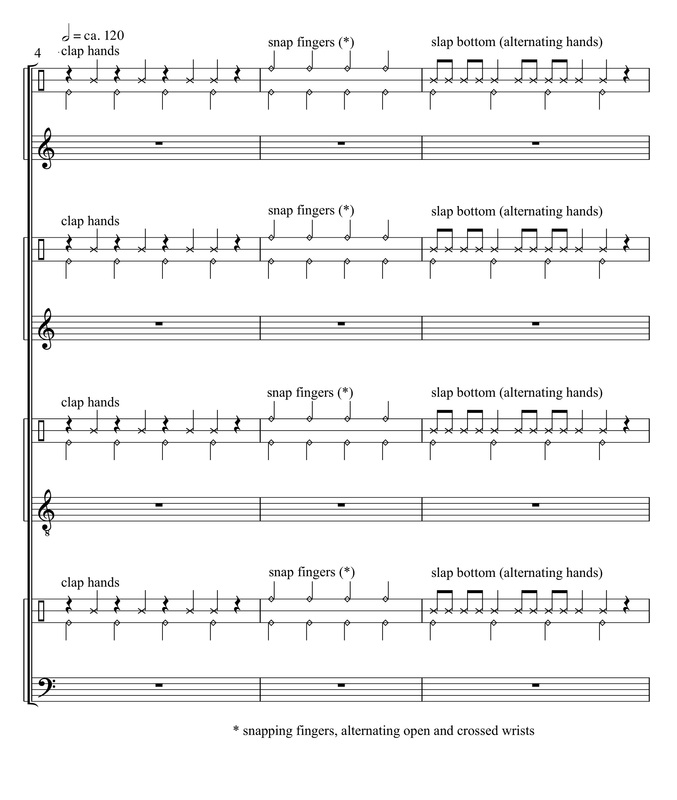 The work is unaccompanied, but incorporates rhythmic foot tapping, finger snapping, clapping, and slapping. Bikkembergs, Kurt, Psalm L. © Copyright by Annie Bank Edition, the Netherlands. Used by permission. Jacqueline Fontyn (b. 1930, Antwerp) knew from the early age of 14 that she wished to be a composer. She studied with Marcel Quinet and Max Deutsch. She taught Music Theory at the Koninklijk Conservatorium (Royal Conservatory) in Antwerp from 1963 to 1990, and then taught at the Brussels Conservatory. In 1993, she was named to the Belgian Royal Academy. 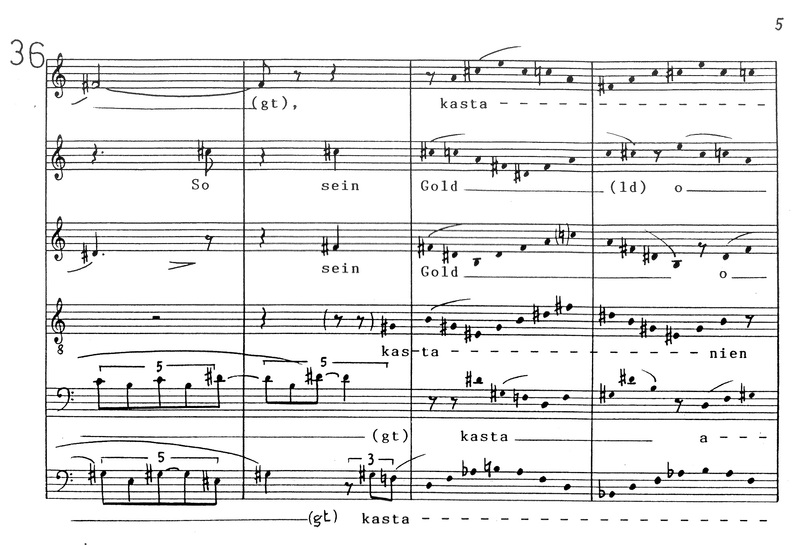 Her 1997 work, Ich Kannte Meine Seele Nicht, is set in German for six voices: either mixed chorus or treble chorus. 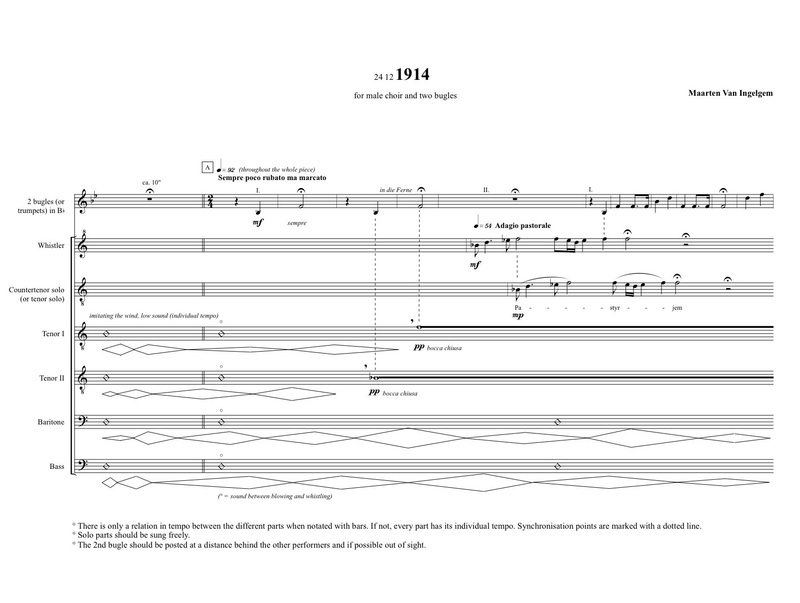 Fontyn gives performer’s notes, and uses indeterminacy and some graphic notation in the score. Fontyn, Jacqueline. Ich Kannte Meine Seele Nicht. © 2009 Sonus Mundi Musikverlag. Used by permission. Maarten Van Ingelgem (b. 1976, Aalst), son of composer Kristian Van Ingelgem, studied piano at the Brussels Conservatory with Jan Michiels, and then composition at the Antwerp Conservatory with Wim Henderickx. 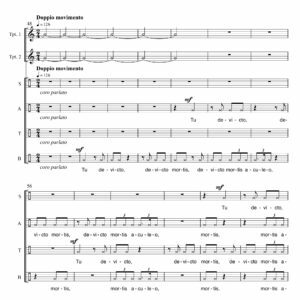 Maarten Van Ingelgem directs De 2de Adem (The Second Breath), a chamber choir specializing in contemporary music, and sings in the Aquarius Kamerkoor and the Vlaams Radiokoor (Flemish Radio Choir). 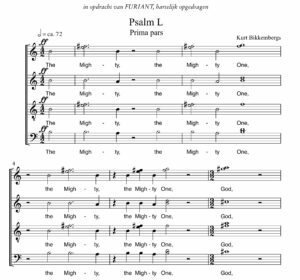 He was named a 2008 winner of the “Golden Poppy” by SABAM (Belgian performing rights organization) for choral composition. 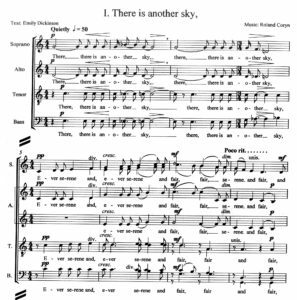 His compositions are for treble choirs, male choirs, and youth choirs (with singers up to perhaps age 30). His 2009 work, 1914, was commissioned by Molitva. 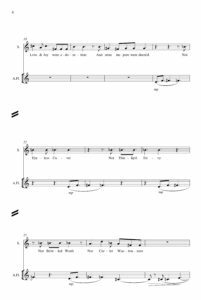 It is scored for TTBB, 4 soli and 2 bugles, but written in Slavonic. 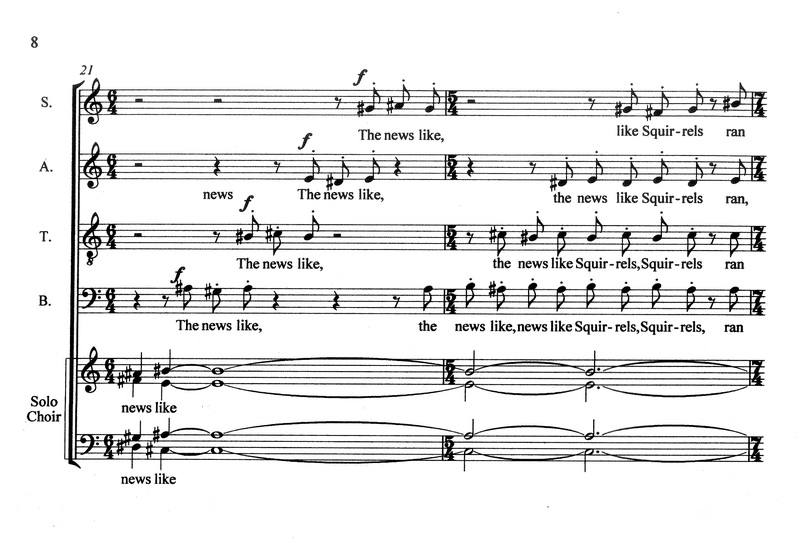 The work, which depicts “The Christmas Truce” of World War I, in which soldiers on both sides stopped fighting, makes use of extra-musical effects. Van Ingelgem, Maarten. 1914. ©2009. Used by permission.